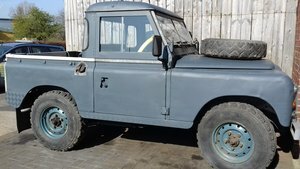 Rebuilt over the last few years, this Marine Blue Land Rover has been kept as original as possible whilst restoring its aesthetics. The original 2.25 Petrol which runs smoothly, has been detailed to a high standard using factory correct colours. The rare combination of the truck cab offers security and warmth whilst the 3/4 canvas maintains the Land Rovers iconic character and practicality. The gearbox and transfer box are faultless with no leaks, enhancing the 4x4 capabilities of this vehicle. The binnacle shows this Land Rover has covered 59,000 miles, believed to be original. It has been dry stored for the last 5 years. 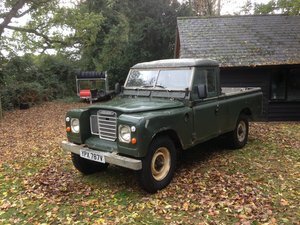 The Patina look is emphasised by original panels and paintwork, with the added advantage of it being Tax and MOT exempt. 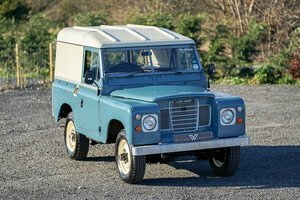 The solid Marine Blue enamelled chassis is the vehicle’s original chassis which has been carefully preserved and protected. The 7 Pin trailer light socket and Exmoor Trim Canvas offers potential for numerous adventures. The recent restoration has included fitting numerous new parts including the fuel tank, front bumper, exhaust, rear leaf springs, galvanised inner wing mudshields, glazed door tops, two 3-point inertia seatbelts, Deluxe seats, door handles and locks, headlining and many more. The engine received a full fluids and filter service, along with new NGK spark plugs, coolant hoses, 12V battery, fuel pump and fan belt. The carburettor has been fitted with new jets and tuned correctly. The entire brake system has been renewed with copper Nickel brake lines, callipers, drums, master cylinder, unions and hoses. All nuts and bolts removed have been replaced with metric stainless-steel fittings. Any leaks found along the way have been attended to. Even though this Land Rover is MOT exempt, due to the work carried out, it comes with an MOT valid till January 2020. There are countless photos of the progress if more are required. This future investment is a very solid example, which is ready to use and enjoy.